TENAFLY, NJ – It was a day of sunshine and hope in Northern New Jersey as the parishioners and friends of the Cathedral of St. John the Theologian in Tenafly joined clergy led by Metropolitan Evangelos and the Dean, Rev. Panagiotis Lekkas, for the consecration of the chapel of the Kimisis tis Theotokou – The Dormition of the Theotokos. The ancient ceremony was preceded by a dramatic procession by the entire congregation led by the clergy and the altar boys in full Byzantine regalia of crimson and gold robes. The consecration, which marked the transformation of the chapel from a humble place of prayer to a house of worship, was one of three services performed on Sunday, including the Orthros and the Divine Liturgy. 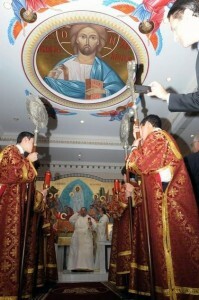 The most memorable moment came when the Metropolitan, surrounded by Archons of the Ecumenical Patriarchate and parish leaders in the beautiful new lobby with its tall triple-arch windows, which along with the renovation of the parish offices was part of the project, ritually banged on the chapel door with his pastoral staff. Inside the chapel the glowing frescoes created by Stefan and Tanya Kaloudov. The scenes, whch correspond to each of the alphabetized verses of the great Akathistos Hymn dedicated to the Theotokos, now complement the magnificent mosaics created by Sirio Tonelli that adorn the nearby sanctuary, which was built in 1969. The carved wooden pews and marble floor are new, as is the unique – for 2013 America – iconostasis. As in the early church, the altar is not completely walled off from the congregation. Small icons are affixed atop the marble parapet that was elegantly carved with crosses in theByzantine style.